If your old grips are hard, worn out, or need replacing because of any reason, you’ve come to the right place. Cycling can be taxing and tough, especially if you are a racer or love to trek through bumpy trails. The last thing you want is for your hands and shoulders to feel exhausted or uncomfortable while riding. What you need in your handlebars is comfort, which Pro Bike Grips (TM) gladly provides! When you go on long rides, your hands will not get cramped or numb, because Pro Bike Grips(TM) has soft cushioned rubber grips which reduce the impact of vibration, and wide anatomical contoured design that prevents your palms from slipping, even when they’re sweaty. If you have hand arthritis or dislike wearing gloves, these grips are the trick! The length is approx. 5″, meaning that Pro Bike Grips(TM) will fit most handlebars just fine. They are also very easy to install and adjust, no glues needed. And, we know your bike grips tend to rotate and work themselves off the handlebars from a lot of jostling. That’s why we feature dual aluminum clamps to securely hold these grips on your handlebars. Pro Bike Grips(TM) will be your best bike riding companion for a thousand rides to come. Get yours today and improve your riding experience! 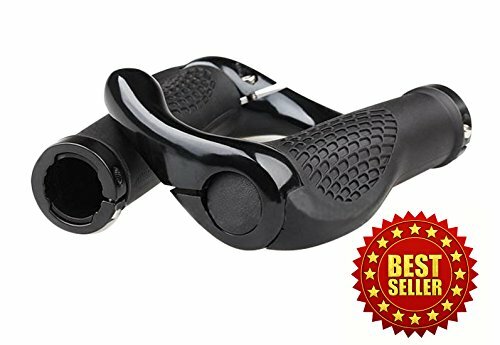 pro bike grips, bike, bicycle, riding, grips, handle, rubber grips, comfortable grip, ride, anti slip grip, ergonomic design, strong clamps grip, best gripThe Comfiest Bike Grips – Pro Bike Grips(TM) will make bike riding more comfortable! The cushy surface will cut down vibration, and the paddle shape is a perfect resting place for inner palms and thumbs. It relieves pressure when you go on long rides, so your hands will not get cramped or numb; perfect if you have arthritis. The wide anatomical contoured design prevents your hands from slipping, even when sweaty. If you hate wearing gloves, this is the ticket! Perfect Secure Fit with Strong Lock-on Clamps – One of the issues that most bikers have to deal with is that their bike grips rotate and work themselves off the handlebars, caused by a lot of jostling on bumpy trails. That’s why we feature a lock-on clamp at both ends to securely hold these grips on the handlebars. Hundreds of rides later, they will not move an inch! From tip to tip, the length is approx. 5″, meaning that Pro Bike Grips (TM) will fit most handlebars just fine. Super Simple Installation – Pro Bike Grips (TM) is very easy to install and adjust, no glues needed. Dip these grips in warm soapy water, and slide them onto the bars. Twist and turn using a towel for better traction, and these grips will go on without any trouble. In just two minutes, you can have them securely installed, and you can freely adjust the angles for your riding preference. Extremely Durable Rubber and Aluminum Alloy — Pro Bike Grips(TM) is made of premium rubber that will not irritate your skin or get gummy in the sun. The aluminum alloy inner ring is extremely sturdy with hard inner core, so the screws and clamps will not crack easily. Even if you keep your bike outside, exposed to all kinds of weathers, these premium grips will hold up well. They can withstand quite a few rough rides, and will definitely last hundreds more.